We are no chefs and we are no food photographers but we definitely know how to cook and trust me, this chicken is easy to make and YUMMY!! We cut the chicken in 6 pieces and wash it thoroughly. We put it in a baking pan. In a bowl we mix up the lemon’s juice, the olive oil, our oregano, thyme, the chopped sage, the krokos Kozanis, the onions and we add salt and fresh ground pepper. We cover our chicken with the delicious marinade and put it in the fridge for 4 hours. After 4 hours of marinating has passed, we preheat our oven at 420 degrees Fahrenheit and roast the chicken in its juices for about 45 minutes. When the chicken is ready we take it out of the oven. We mix in a bowl our FULL FAT yogurt with the eggs and 30 ml water. 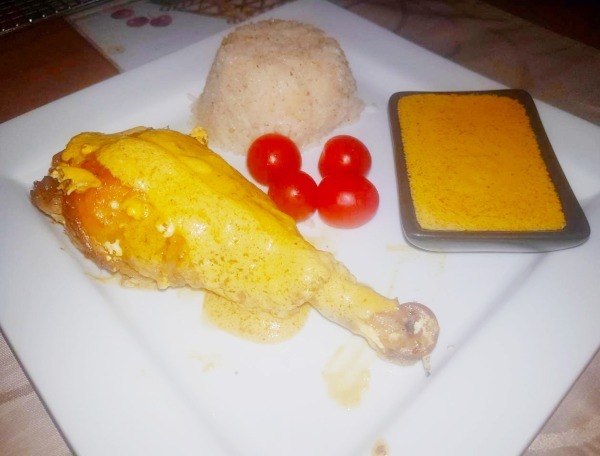 We cover the chicken with the sauce and put it back in the oven until we have a creamy sauce (if your sauce is not uniformly creamy as it should, you can put the juices in a bowl and mix with an immersion blender, or in a blender and blend, for one minute and then serve over the chicken). We serve with rice or fries.